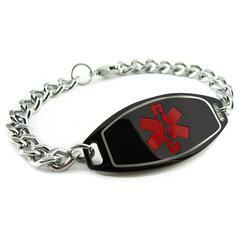 Stainless steel Black plated medical id bracelet. This medical ID bracelet is neatly styled with a stainless steel ID plate which is brushed steel on the back and Black Plated on the front with the red or white medical alert symbol. This bracelet is designed with stainless steel curb chain This medical bracelet can be worn all day and water will not affect this item.Custom engraved on the back in back laser at no additional charges. Stainless Steel, Curb Chain, lobster clasp Custom Sized from 5-10 inches Black Plating on Front Tag measures 1.75" x .75" Brushed finish on he back.